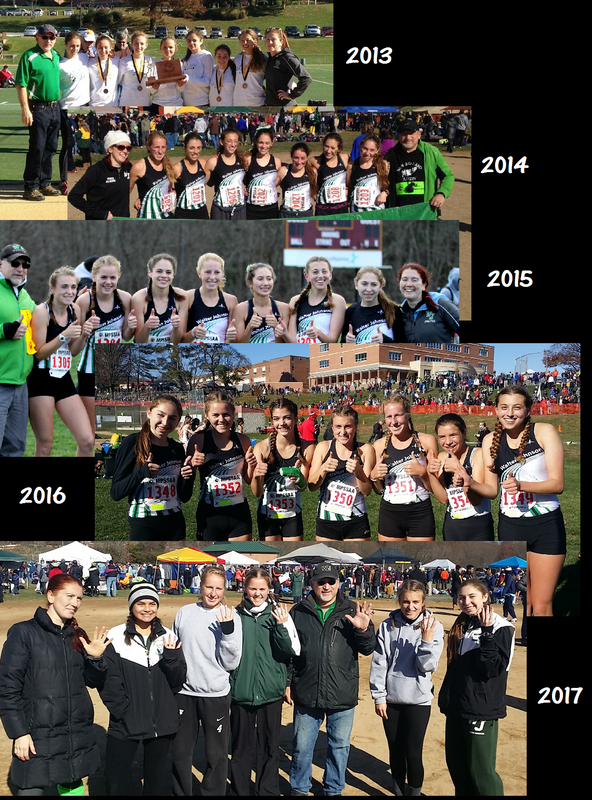 The Walter Johnson High School girls cross-country team set an MPSSAA record by becoming the first Maryland girls team in history to win five consecutive cross-country state titles in any classification. Five is truly a magic number. It meant that their winning ways spanned more than just one class of superstar runners. Outsiders may roll their eyes with indifference, but inside the Walter Johnson program, the 2017 state title was cherished above all others. "This is unbelievable," said head coach, Tom Martin. "...up until this year, it's been like, 'Okay, let's keep them healthy and get them to the line, and they'll do what they have to do.' ...So many problems we had." Injuries piled up all season for the Wildcats. 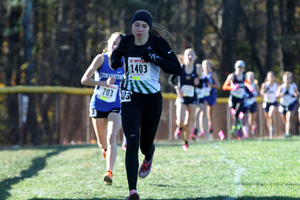 Helena Abbott, who finished 29th in the state last year, was lost early in the season due to injury. Sadie Keller, who finished 13th in the state last year, dealt with shin splints all season and lost "an incredible amount of training," according to Martin. 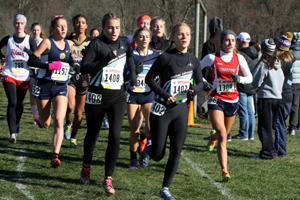 Sophia Scobell, who finished 22nd in the state last year, dealt with two separate issues, a torn labrum and a hip impingement, all season. WJ had no choice but to embrace the next-girl-up mentality. Call it a culture of excellence or call it luck: the next girl up always seemed to thrive on the varsity roster. By making substitution after substitution, WJ emerged at the end of the season to win the Glory Days Invitational, the Montgomery County Championship Meet, and the 4A West Regional Meet. It seemed as if the girls in green could do no wrong. Yet, inside the program, coaches knew that the rash of injuries was catching up to them. Yet another runner went down at the regional meet so that only six runners finished the race. It was determined that that fallen runner could not run the state meet. Scobell, who bypassed the region meet, was a last minute decision. Coaches made the difficult decision to pull her out on the eve of the state meet. "Last night...we determined that [Scobell's] injury wouldn't allow her to race today so we had to make some last minute changes," said Martin on Saturday. "Her doctor said she could race and it wouldn't get worse so we explored that all week, but the pain levels were incredibly high. She couldn't run without limping. No state championship is worth hurting a kid over." "Having Sophie out, I thought was just too much," said Martin on his team's chances of winning the state meet. 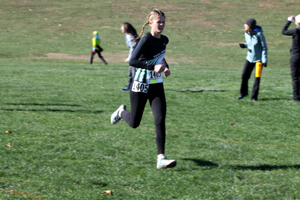 With an individual win by Abigail Green, All-State finishes by Janet Scott and Jenna Goldberg, and a 31st place finish by Caroline Kennon, WJ had the best top four runners in the 4A race, place-for-place. Only Severna Park had a better fifth runner, but WJ edged out Severna Park 83 to 98 on the strength of its low numbers up front. "Abbey ran the exact race that she should have," said Martin. "She got early separation on the pack and just powered away to victory...so we were really happy with the way she ran today." "Janet ran a really smart race. We wanted her to come from behind. She did that and finally ended up in fifth place. Same strategy with Jenna Goldberg. She ran so tough, letting the front of the race out there that first mile and then coming back strong the second two... And then Caroline: huge race! And Camille right next to her. They ran really tough and they just found a way to do it today. I'm just as happy as I could be because of the way that they did it." Unlike in previous years, WJ could not celebrate in the finish chute. The race was much too close to call. And even though race results are published on the internet very quickly these days, the first published results of the day seemed to take an eternity. Said Janet Scott, "We were a little bit hesitant after the race. We weren't sure. We knew a bunch of us felt pretty good but we also knew that Severna Park had a really good day so we weren't 100% sure. So I was a little bit nervous, but then we found out when we were leaving for our cooldown. Abbey pulled up the results and we found out and we were all so ecstatic. We started jumping up. We were so happy because we were like, 'We did it.' It was really exciting." Scott began to tear up when she explained what it meant to her and her teammates: "It's so amazing. We were all so excited when we found out. After our races, a couple of us huddled up and we were just crying and talking to each other. It means so much to us. We've all worked so hard...Just knowing...and looking at my teammates and just realizing that we did this together. We worked really hard to get these four years and that's just all that I could have asked for." 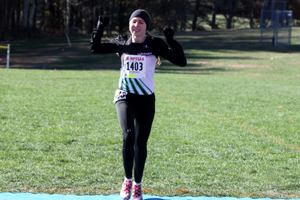 Abigail Green on winning her first individual cross country state title: "It means so much. It's definitely been something that's been on my mind for a long time. It was definitely something that I really wanted to check off my list before I graduated and so it's really special to be able to get that done, and of course it's even more special to have won a fifth state championship as a team and my fourth, so just overall I feel like it was a perfect day because it was both great for the team and great individually. Green on the frigid 25 degree weather: "This is probably the coldest it's been for the four years that I've run at Hereford. I feel like definitely bundling up was helpful. All of us wore long pants and long shirts, so I feel like that was definitely more comfortable than if we didn't. And so I feel like we prepared for it. We were ready for it. In terms of temperature it was kind of shock to the system with how cold it was, but I feel like it's always going to be hard no matter what weather it is so you just have to adapt."